Deliveries Monday to Friday (working hours only). 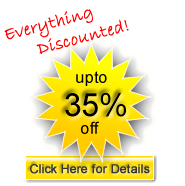 Most UK delivery charges are subsidised by Fireparts.com from our product profit. International Courier (3 - 5 working days from ordering) upto 30kg. We quote an automatic price on the web, however, call us and we will obtain a manual quote from Couriers for the best price. 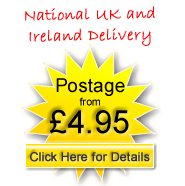 (Ireland can be as low as around £20 +Vat, Europe £45 +Vat, USA £95 No Vat). The price is dependent on area within country. We aim to dispatch orders that are received within 24 to 48 hours. Some parts may have a longer dispatch time (up to 5 working days) as are specially ordered (we will notiffy you). Very occasionally during busy periods (Oct, Nov, Dec, Jan, Feb) there may be a slight delay with dispatch, we do our best to notify you in these instances. Please ensure correct telephone / contact details are provided when ordering so we can reach you quickly. Orders placed over the weekend will be processed on Monday. Packaging costs are included within the delivery costs. We will always ensure your ‘replacement stove or parts’ is well packaged before leaving the warehouse. In the exceptionally unlikely event a part arrives damaged, we will replace it (please send a photo of the damaged item and any damage to packaging - as the couriers will require this for insurance / feedback). Once your order & payment has been received, your 'replacement stove part' will be dispatched. Depending on the courier service you choose at 'checkout' will depend on delivery times. The courier deliver during working hours only, Monday to Friday. We will send you an email (usually within 24 hours) with your expected delivery date & your official VAT invoice for the purchase, if you have not received your delivery by this date, return email us immediately. All goods will require a signature. If you supplied your mobile number at time of delivery, then you should receive a text message from the courier with exact delivery date. If (at the time of placing the order) you left a message in the COMMENTS BOX asking to leave the parcel somewhere, you will also need to 'write & sign' a note and leave on your front door. This then gives the driver authorisation to leave - you will however be responsible for the parcel from this point. Any 'delivery' information you ask us to pass on (at checkout stage) will be sent to the Driver. If you did NOT advise to leave the parcel at time of ordering, then a SIGNED note can still be left advsing the courier an EXACT LOCATION to leave the consignement (even if with a neighbour). We pack our goods well, however should damages can happen in transit, inform us within 48 working hours. A photo will be required to prove the damage to the courier to help with insurance. We will then send you replacement parts. SIGNING FOR GLASS PRODUCTS - IF YOUR GLASS ARRIVES BROKEN DO NOT TOUCH THE PACKAGING IT IS IN - CALL / CONTACT US IMMEDIATELY. IF YOU DISTURB THE PACKAGING IMMEDIATELY AROUND THE GLASS, WE WILL NOT BE ABLE TO HELP WITH YOUR REFUND. Our website is kept up to date with stock status, however, in the event a part is not in stock (subequent to you placing an order), we will promptly advise you. We (& our suppliers) hold a wide range of solid fuel spare parts, so this only happens under rare circumstances. To get an EXACT delivery quote, 'Add' items to 'Shopping Cart' and select 'View Cart' click 'Estimate Shipping & Taxes' and it will quote you a delivery price - you do NOT need to register to get a price.